TORONTO - Ontario's New Democrats are naming their price to prop up the minority Liberals, unveiling their first set of budget demands in what will likely be weeks of negotiations to avoid triggering an election. After public consultations, NDP Leader Andrea Horwath said it's clear the week-old spending plan is placing an unfair burden on families and a more balanced approach is needed. The NDP wants the budget to hike taxes for the wealthy, take HST off home heating bills, protect child care and boost support for the poor. And there are more demands to come, Horwath said. "If we have to choose between helping a working mom who needs child care in order to keep her job and a high five-, six-, seven-figure salary person cashing in on an even greater paycheque every year, I think the choice should be very easy," she said Tuesday. Increasing provincial income tax for people earning more than $500,000 to 13.16 per cent from 11.6 per cent would generate $570 million a year, she said. Currently, they're taxed at the same rate as those earning more than $78,000. 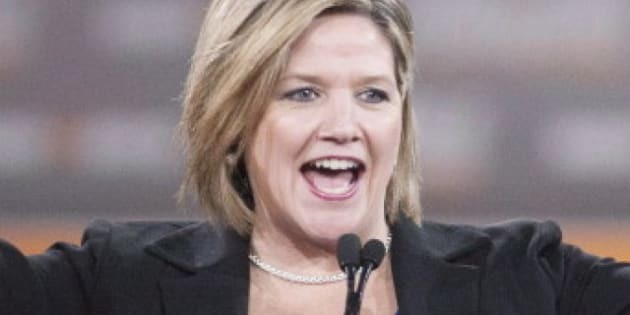 Horwath said the tax would generate enough money to pay for three other NDP demands — removing the HST from home heating bills, protecting 4,000 child-care spaces and a "modest" increase to the Ontario Disability Support Program, which the Liberals plan to freeze for a year. She danced around the issue of whether she would force an election if the Liberals refuse to include her proposals in the budget, saying she's not "drawing lines in the sand" right now. "Ultimately, it will be determined by the government whether they accept the proposal or they don't," she said. "Everyone knows that if the proposals are not accepted, we'll be into an election in Ontario." The Liberals appeared displeased with her wish list and the NDP's plan to draw out their demands, saying the public deserves to know the "full extent and cost" of their proposals. "Today, the NDP kicked off the start of a new spending spree," government House leader John Milloy said in a statement. "This is no way to balance the budget — or discuss the passage of one. This isn't a game. The state of our province's finances is much too important to be used as a PR stunt." Two votes short of a majority, the Liberal government needs the NDP to support their budget or abstain from the vote to avoid falling, which would trigger an election. Opposition Leader Tim Hudak has pledged to vote against the budget, leaving the NDP holding the balance of power. The NDP did see one of their key requests included in the budget — freezing corporate taxes at the current 11.5 per cent, instead of lowering it as scheduled. Horwath said she's still "disappointed," adding her demands "won't be an entire shock" to the Liberals given the discussions between the two parties. Earlier in the day, Premier Dalton McGuinty said he would listen to any new ideas from the NDP to improve the budget, but there are limits. "I've made it very clear to Ms. Horwath and her colleagues we're not prepared to entertain any proposals for new spending," he said. "We just can't afford to do that." There are other conditions as well. Ontario must still slay its deficit by 2017 and protect health care and education, including the rollout of full-day kindergarten for four- and five-year-olds. The premier also accused the Progressive Conservatives of trying to force an "unnecessary and very expensive" election that no one wants — one that would jeopardize Ontario's fragile economic recovery. "There was no genuine or sincere effort to understand what was found in the budget or any effort to speak to us about what it is we might do to make it even stronger," he said. Hudak said there was no point in trying to squeeze McGuinty for concessions, since the premier refused to take the Tories' budget advice last November. One key Tory demand is a mandatory wage freeze for all workers in the broader public sector. The Liberals have threatened legislation if those workers resist a freeze, but only after all other options are exhausted. The crucial budget vote is expected no later than April 25, according to Milloy. In 2005, former federal NDP leader Jack Layton managed to wring $4.6 billion in concessions from the minority Liberal government in exchange for his party's support for the budget. It was one of Layton's greatest triumphs and increased his credibility as an effective leader, paving the way for the NDP's ascent to official Opposition six years later. If Horwath doesn't succeed in getting some of her demands in the budget, she risks damaging her credibility as leader and the party's hopes of breaking free of their third-party status.